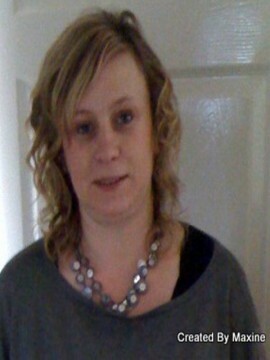 Wanted to announce that we have a new designer as part of the Meiflower design team – Colette. 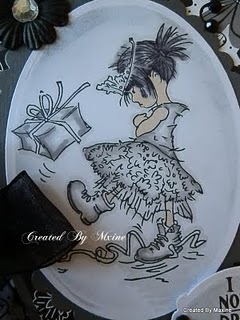 Colette already designs for my friend Wendy at Clipart Fairy, her work is fab!!! 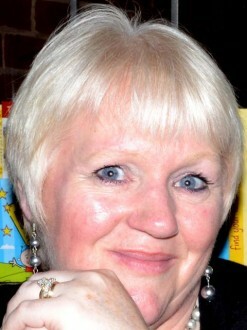 So here is a pic of Colette, abit about her background and a gorgeous sample of her work. 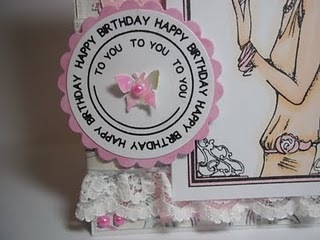 “Like most card makers I started out doing lots of other crafts before I settled into card making. Over the years I have done cross stitch, flower arranging, cake decorating, Faberge style Egg decorating and finally about ten years ago I started doing a little card making, then scrapbooking. Once I discovered digital products there was no stopping me. I now have quite a few digital papers, stamps, clipart, kits etc. My hubby is sitting here laughing as I am writing this and telling me I have about a third of a million digital files, I did say I had quite a few, didnt I LOL”! 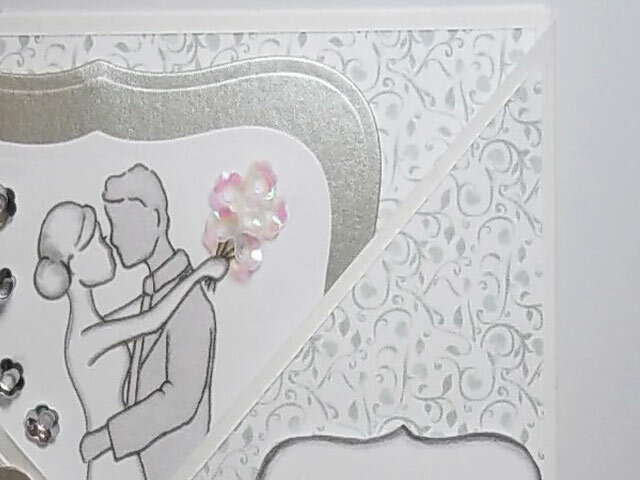 Tracey has made this beautiful wedding card using the clear iridescent sequins and silver blossom sequins to give that extra special effect. 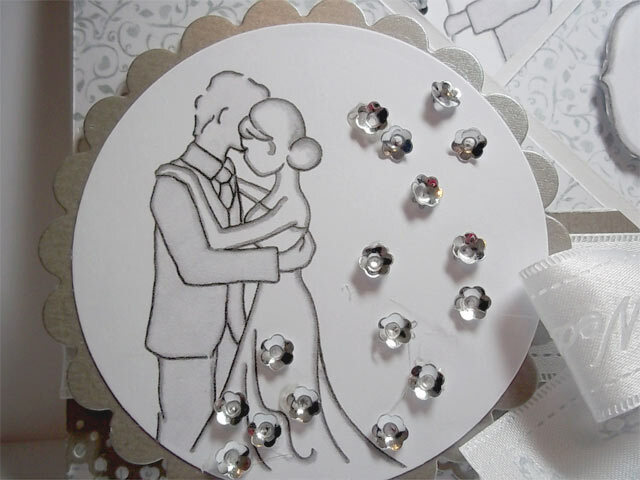 She has also used wedding card images free from PaperCraft Inspirations, you can download them from their site and the papers are from the wedding paper pack by karsal. 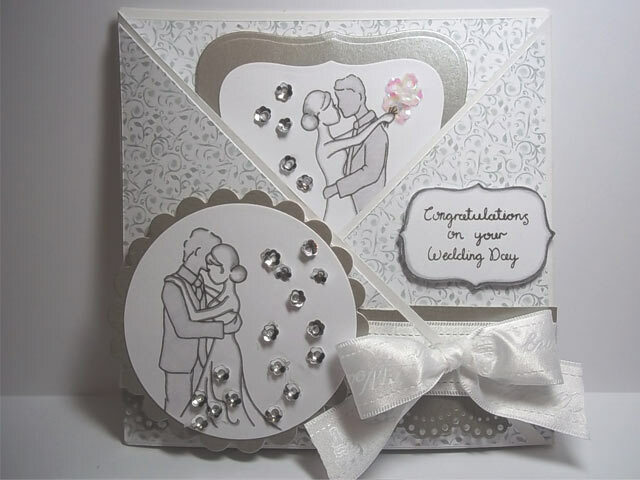 Silver sequins are also used to decorate the card, they are placed randomly and look like silver bubbles rising up the card. A quick tip: stick sequins down with uhu glue, then sprinkle your favourite glitter over, wait for it to dry. . . and then you have flowers with glittery centres !! I love the way Tracey has used the clear iridescent blossom sequins to create a lovely bouquet of flowers, it works really well in relation to the size of the image. Thank you for making this amazing card Tracey! 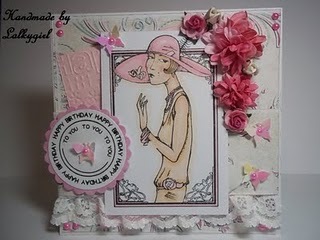 Our lovely DT Tracey has made this gorgeous card using an Art Deco image from Craft UK, she’s also embellished the card with butterfly sequins and stick on gems. You can read more about her design over on Tracey’s blog. Meet our fab new designer for Meiflower……. Maxine! I first got to know Maxine on the Trimcraft forum and managed to meet up with her last year at the Craft show in Birmingham. Maxine is also a moderator on the Trimcraft forum. I love her work, very cute and chic! 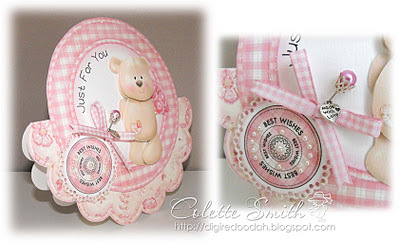 I’ve loved crafting from a very young age and have tried lots of different crafts. 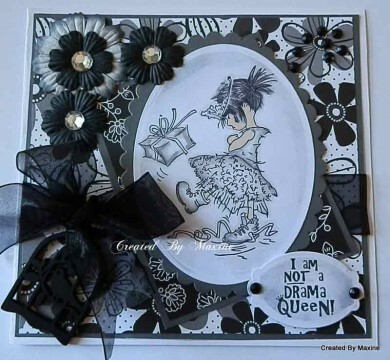 My passion is card making, I started card making 3 years ago and then tried other paper crafts, scrap booking,making paper bag albums and atc’s. I love sitting in my craft room creating. I also like sewing, baking and gardening. This is a card made by Maxine. 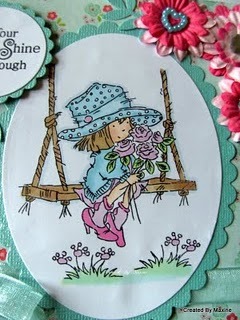 I love the girl in this card, she is so cute! The card looks very glamorous as well. 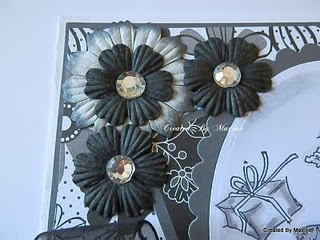 I’ve not made a monochrome card for a while and found the flowers in my stash and they gave me the idea. 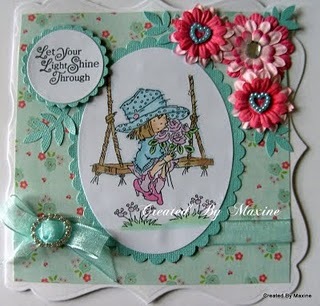 The flowers are from Bee Crafty, I was very lucky and won a big bundle from Craft Stamper magazine a while ago. I love this image from LOTV and thought the sentiment works so well with it, I can’t remember where I got the sentiment stamp from. The papers are a 6×6 pad from Paper Cellar. 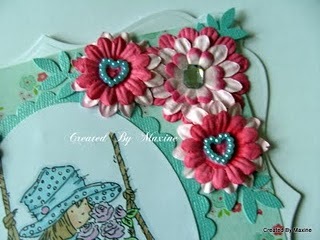 All of the other embellishments, gems and organza ribbon are from Meiflower Crafts. 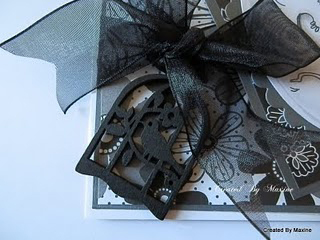 I love the wooden birdcage embellishments and the black gems were perfect for this card. I love the way Maxine used the ribbon to match the tie in the birdcage. Well done Maxine, absolutely love this card!